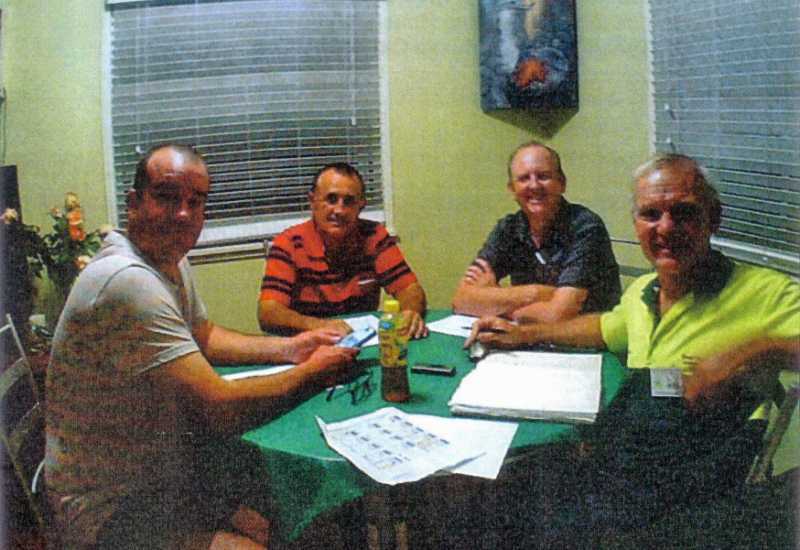 The Queensland branch of The Australian Hovercraft Federation held a planning meeting on Tuesday, 19th April 2016, at the Coopers Plains Library in Orange Grove Road. Other members attending were Angus Kerr, Dale Baxter, Arthur Stead, Les Taylor, Kim Allen, Dwayne Morgan, Gunter Prischl, Cle Sheck, Dieter Reniesch. Visitor for the evening and chauffeur for our esteemed Treasurer was Kerri Audsley. Cruise report - Muriel St, Redland Bay - Sunday 10th April 2016. The last club cruise was held on Sunday 10th April 2016, launching from 96 Muriel Street, Redland Bay courtesy of Peter and Elaine Venn. Peter Venn Turbo TP6 powered by a Subaru 1800 EA81 and 18hp Honda. Angus Kerr Viper 4 cruiser powered by a Subaru 1800 EA81. Michael Stephenson Turbo Wedge 240 powered by a Rotax - Baffle. Les Taylor Turbo Superwedge 235 - Phoenix. Kim Allen Turbo Wedge 240 with Yamaha PE485 - Justy 2. Other club members and visitors attending were Steven Odgaard, Phil & Kerri Audsley, Ben Woodhead with Gowan & Calum, Steve Stephens, Dieter Renisch, James Allen, Judy Bowman, Amelia Torrance, Dillon Forrest, Susan Stephenson, David Venn with Thomas & Ruth and Elaine Venn. 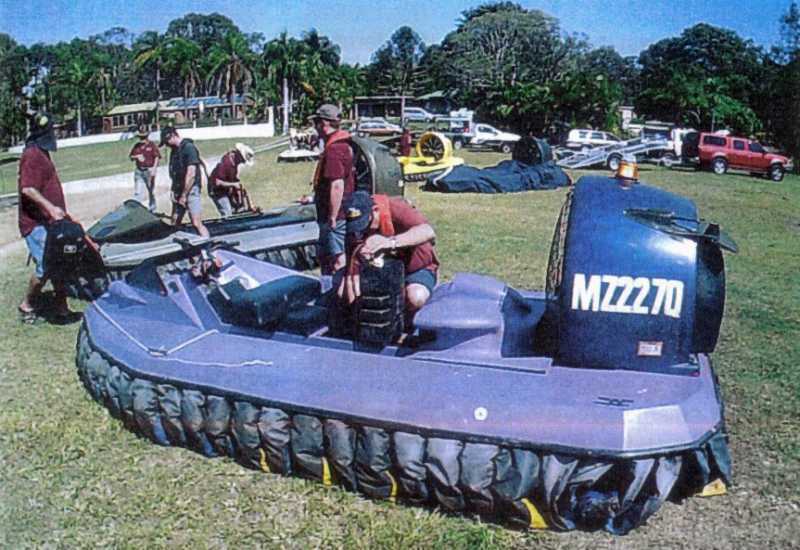 A total of 24 people and 9 hovercraft. Peter Venn set off at 11:00 am in the TP6 with James Allen and Ben Woodhead. James King followed in the Viper 5XC with Dieter Renisch, Karl Bowman in a Viper 4X, Michael and Susan Stephenson in the Turbo 240 Wedge with a Rotax (Baffle), Kim Allen in the Turbo 240 Wedge with a Yamaha PE485 (Tool City) and Angus Kerr in the Viper 4 cruiser with Dillon Forrest. They landed and regrouped at the western end of Karragarra Island. Michael Stephenson was unable to restart Baffle, so Peter Venn returned with Ben Woodhead who went to the rescue with his 3.7m Alycat Barra Boat with 30hp Tohatsu Outboard engine and 2 tow mats. They performed a remarkably successful retrieval of Michael Stephenson's Baffle. Kim Allen, James King, Karl Bowman and Angus Kerr continued on to Russell Island to catch a glimpse of the canoe race. Karl and Dieter returned in the Viper 4X at 1:10 pm, James King returned in the Viper 5XC at 1:11 pm with Michael and Dillon, Angus Kerr returned in the Viper 4 cruiser at 1:20 pm with Les Taylor and Kim Allen returned in the Turbo 240 Wedge (Tool city) at 1:21 pm. Les Taylor and Kim Allen gave a demonstration of a reversing Turbo 235 Superwedge using bucket rudders & ropes (at this stage) to steer. Servo control units on order from the USA. Peter Venn went out with James Allen in the TP6. Angus Kerr took Dillon Forrest and Amelia Torrance in the Viper 4 cruiser. James King in the Viper 4X. Karl Bowman in the Viper 5XC. Karl Bowman had a suspected broken engine mount on the northern side of Lamb Island so Peter Venn's tinnie with 15hp outboard was deployed at 4:15 pm with tow tarp onboard. Due to low tide it had to navigate the long way via Logan River and Russell Island. Angus rang at 5:10 pm and abandoned the rescue effort until Monday morning due to failing daylight. James King returned to base at 5:15 pm and Angus Kerr and Peter Venn returned at 6:00 pm. Steven Odgaard returned in the tinnie at 6:15 pm and left for home at 6:50 pm. A long day. An AHF phone-conference meeting was held on Wednesday 6th April 2016 to discuss possible ammentments to the club constitution to cater for the increasing number of remote memberships via the AHF Forum. Victoria - Peter Streader, Rachel Smithson, Paul Moody. South Australia - Kevin Dixon, Bruno Davids. Western Australia - Stuart Herring. - Dwayne Morgan & Les Taylor. The Queensland State Rally will be held on the weekend of 9th & 10th July 2016 at Lake Coolmunda near Inglewood, about 3 hours S.W. of Brisbane. This is the venue for the next Australian National Rally and we need to spend some time here with reconnaissance of the area to finalise our preparations for 2017. The Queensland Sporting Hovercraft Club will host the Australian National Rally at Lake Coolmunda near Inglewood, 256km S.W. of Brisbane via Warwick, on the 7th, 8th & 9th July 2017. More details will be available at rally.qover.com after the Queensland rally in July this tear. The next club cruise will be held on Sunday 15th May 2016 at Muriel St, Redland Bay. 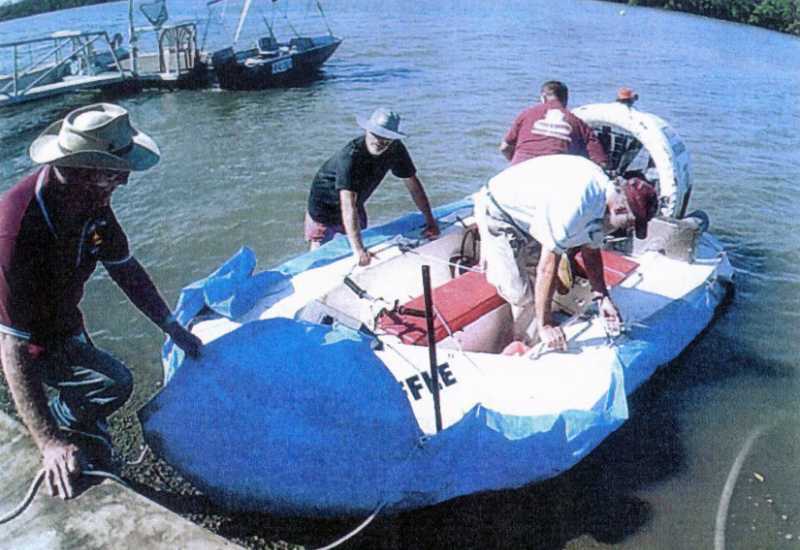 Meet at 9:00 am at 96 Muriel St, Redland Bay for a launch into the Redland Bay Channel. President Peter Venn and Elaine Venn have provided a white patch of sand and a refreshments marquee adjacent to the launch pad. A pontoon makes an ideal location for movie cameramen to capture the uncontrolled expressions on the faces of anyone entering the water for the first time in an amphibious vehicle. The next club meeting will be held on Tuesday 17th May 2016 at 7:30pm. UBD Reference - Map 200 D13.